Bring a pair of horses into your office? Whoa! For the last 10-15 years, desk top, then laptop computers have become the “filing cabinet” of choice. Many of us are lightening the look around the office from loads of paper and wire nests to virtual back up scenarios and wireless devices. This means desks don’t have to hide all of our clutter, just allow for a fluid workspace and maybe a few choice accessories. In addition, eclectic design, such as shiny metallics and reclaimed wood or sleek with antique, has influenced even home office decor. Simple items that create a wow factor by simply re-purposing them is a hip way to show off your design sense. The saw horse desk is a perfect example. From worn wood slipped into shiny saw horse hinges, to saw horses that are spray coated a powerful color or basic white, this former garage sale table leg has become elevated to the tandem force under a glass or wood desk top area. Sleek, stylish and functional. Add an industrial look lamp and possibly an old tin gas station sign on the wall, and your office is now grand grunge. 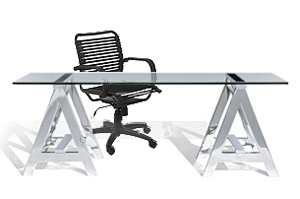 I have this in my home office – love the flexibility. Some saw horses have height adjustment too, so that’s a handy feature, much more flexible than the old fashioned oak desk, and the bottom rack can double as a place for the printer as well. Love the industrial perspective on office design.